Effective communication is indispensable in today’s wired world. With more and more interaction taking place electronically through different media platforms, the correct choice of a medium of expression can make all the difference. How will a Bachelor’s Degree in Communication benefit me? A bachelor in communication program will provide you with the skills needed to formulate, maintain and evaluate different modes of communication between individuals, groups, and the mass public. The related courses are designed to instruct the students in speech techniques, research skills, critical thinking skills, and the conceptual knowledge that is relevant to public interaction through persuasion and rhetoric. The B.A. degree involves more coursework in humanities, whereas the B.S. degree places more emphasis on coursework in technical and science skills. Apart from campus-based programs, a number of online programs offer a bachelor in communication as well. Online programs can offer a range of benefits. They provide space for designing a learning schedule which will really seem like a blessing if you have a busy routine. They also cost much less than the campus-based programs due to the low cost of online education. The program curriculum is usually divided into general education courses, core courses and electives. General education courses usually include areas such as mathematics, humanities, social sciences, and communication arts. This course is an introduction in the field of communication studies, with a focus on the history of communication, important concepts, context, and various issues faced. It examines the basic theories of mass communication. It also teaches ethical problems from a historical and contemporary perspective. This course aims to examine the legal environment and its specific laws applicable in communication. This course examines the role of public relations in marketing and how the related principles can be used to achieve marketing and sales objectives. This course focuses specially on ethical issues inherent in public and personal forms of communication. This course provides students with concepts and methods related to marketing communication. It emphasizes the mix of marketing tools such as product, price, place and promotion along with other similar instruments. This course analyzes various elements of sales communications. Different topics covered include personal selling, sales promotion, and customer relationship management. This course focuses on consumer behavior and marketing research. It also analyzes the effect of consumer behavior on local and global marketing communication. The above mentioned curriculum is typical for many schools. However, you should keep in mind that it may vary between programs. These professionals plan, review and revise content for various publications. These professionals are responsible for creating and maintaining a favorable image for the organizations they represent. Technical writers prepare journal articles, instruction manuals, and other supporting documents to communicate complex information easily. These professionals deliver news and reports of events and other happenings to the public. They also report for newspapers, websites, radio and televisions. How long does it take to get a communications degree? A bachelor’s in communication can take four years of full-time study to complete. 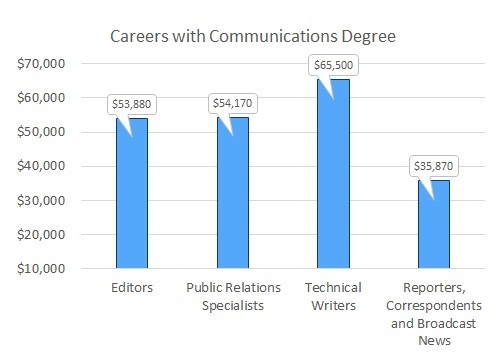 An associate degree in communications would take two years to complete, whereas a graduate degree such as a master's in communication would take two years to complete as well. What are the requirements to get a communications degree? Entry requirements for a communications degree would depend on the level you are applying at. For instance, if you are applying for a master’s in communications, you will need to meet a minimum GPA criterion, provide several letters of recommendation and GRE scores. You will also need to have completed an undergraduate degree in a related field. How much can I make with a communications degree? A communications degree can lead to a variety of careers options such as public relations specialists, technical writers, reporters, correspondents and editors. According to the US Bureau of Labor Statistics, Public Relations Specialists made an annual median income of $59,300 per annum in 2017, whereas editors made $58,770 and Public Relations and Fundraising Managers made $111,280 per year. Q:How much can I earn with a Bachelor of Communication degree? A:You can earn 34,000 to 52,000 US dollars with a Bachelor of Communication degree. Your salary is highly dependent on your degree level, expertise and the location of your employer. Q:What is the significance of the Bachelor Communications Degree Program? A:The Bachelor in Communications Degree program is a multi-purpose degree that opens up gigantic job opportunities in every sector of the economy. Every big or small, every organization requires communication personnel to boost up the image of their organization. Q:Name popular careers for bachelors in business and communications? A:Students with degrees in business and communications can join various industries that require the services of communications personnel. These organizations include advertising agencies, retail organizations, manufacturing organizations, fashion and design houses, hospitality organizations, banking and finance corporations, and many more. Popular careers that can be pursued with this degree include managerial jobs such as advertising manager, promotion manager, public relations manager, market research manager, sales manager. Q:What is the benefit of completing the Bachelors in Business Communications online? A:The online Bachelor in Business Communications allows students to complete the degree at their own pace and make their own class schedules. Students can take the class from anywhere in the world with just an internet connection. The flexibility of the online programs allows students to work alongside studying. Students also get to save quite a bit on the tuition fee as compared to the campus based program. Q:As I read on how much can Bachelor in Communications pay, there was mention of the course on MS Office Applications. What is taught in this course? A:The articles highlighting on Bachelor in Communications pay stress on the course in MS Office Applications. This course is worth 4 credits in total and highlights on helping the students in getting started in working over computers. The primary focus will be on Word and Excel as well as other applications of Microsoft Word. Q:As I read on the Bachelor of Communication jobs, there was mention of the course on System Analysis & Design. What are the contents of this course? A:It is true that you get to see the mention of course on System Analysis & Design while getting to read about the Bachelor of Communication jobs. This is a 4 credits worth course and highlights on the development of the desired computer systems that will allow the wanted tasks to be aptly performed, without any jamming. Q:What are the contents of the course on Local Area Networks in the Bachelors in Communication careers? A:The Bachelors in Communication careers have a dedicated course on Local Area Networks. This is a 4 credits worth course which aims to provide the students with the primary concepts revolving around operations, wireless networking and cabling. Other areas of study include protocols, architecture of communications, designing of network and administrative support. Q:While searching for careers with a Bachelors in Communications, I came across public relations. What is the job description for this profession? A:Searching for careers with a bachelor in communications would mention public relations. This job requires professionals to co ordinate an effective communications strategy on behalf of an individual or an organization. A communications professional acts as the spokesperson and is responsible for the release of information to and from its employer. These professionals can find themselves employed for corporates, personalities and government institutions. Q:Reading about jobs with a bachelors in communications and marketing degree mentioned communication analyst. What is the job description for this profession? A:Communication analyst would be mentioned when searching for jobs with Bachelors in Communications and Marketing degree. These professionals work in both private and federally administered organizations. Communication Analysts are responsible for designing, evaluating and proofing LAN's, WAN's and internet. They are also required to extract data and based on the analysis design future networks. With the communications industry showing positive growth, there is a lot of potential for students interested in this profession. Q:Can a bachelor in communications degree be completed in less than four years? A:Yes, a bachelor in communications degree can be completed in less than four years. There are a number of colleges that focus on accelerated bachelor degrees. These programs can be completed in 1-2 years or even less. The curriculum of an accelerated bachelor degree in communications is more vigorous and requires hard work. Q:What is a bachelors of communications all about? A:A bachelor of communications is a four year long degree. It is becoming increasingly popular as communication is gaining more significance in the time we live in. It is a degree that is particularly beneficial for marketing and business careers. In fact most of the organizations rely on communication experts to help them sell their products, gain more visibility in the corporate world and build beneficial relations. Q:With a Communications?Bachelors degree, if I go into technical writing how much will I earn? A:With a Bachelors degree in communications, you will be well suited to a career in technical writing. Your exact pay level will depend on a number of factors such as your education, skill and experience. According to US bureau of Labor Statistics, The median annual wage for technical writers was $65,500 in May 2012. Q:I am looking for an online BA Communications. Will it reduce my education cost? A:An online BA Communications can be a good option for you, if you need to keep your education costs down. Online programs do not require you to pay for various costs that are normally associated with campus based education. These costs include travelling, hostel accommodation, and textbooks. Besides, online programs normally charge lesser tuition fees due to their cost efficient setup. Q:How many years or months does it take to complete a BA in Communications? A:A BA in communications is an undergraduate degree. It is offered by many colleges throughout the nation. Although the exact duration of the program may vary slightly from college to college, typically the program takes four years to complete. You can also choose an accelerated BA degree which will take less than four years to complete. Q:Why is it important to look for an accredited BS Communications? A:If you are looking for a bachelor's degree in Communications, it is important that you confirm that the program is accredited by an authentic accreditation agency. Accreditation programs meet the set standards, so you are likely to get good quality education. Besides, employers also prefer candidates who have graduated from an accredited program. Q:What is the program structure and curriculum of a bs in Communications degree? A:Usually a bachelor's degree in communication is completed in four years. The program teaches essential communication skills used in a wide array of careers. Some of the courses offered include writing communication, public speaking, group communication, media studies, mass communication, public relations, ethics, and conflict management. Students are also taught effective communication through websites and other tools. Q:How long does it take to finish a Bachelors in Communications? A:A bachelor's in communications is typically a four degree program if taken full time and on-campus. However, with the advent of online learning, students now also have flexible degree options. Due to these you can finish your degree earlier or later than the standard four year mark, while studying from the comfort of your own home. Q:What are the application requirements for the Bachelors in Communication? A:A bachelor's in communication degree require students to submit a completed application form, all supporting documents, application fee, high school transcripts as well as letters of recommendation from past teachers. However, only students with a high school diploma or a GED certificate will be eligible to apply to this undergrad degree.